Hello again from edX headquarters! We’ve spent the month of February working on exciting new features for you and your learners. 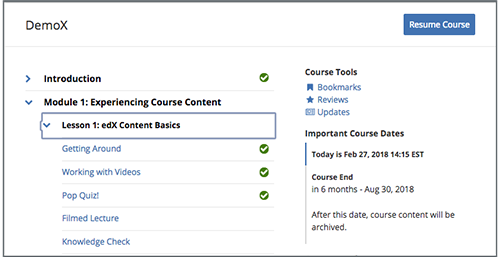 Our course pages now include visible progress indicators! These green check marks appear in the navigation bar when a learner completes a unit, providing encouragement to learners as they work through each subsection. Learners complete a unit when they have viewed all video and HTML content and submitted answers to all problems. For more information, see Progress Indicators in the Open edX Learner’s Guide. Some of our learners love to take sneak peeks at upcoming course content, but might have trouble finding their way back to where they were working. To help these intrepid explorers, we’ve updated the Resume Course button on the Course page so that it now returns the learner to the last unit that the learner completed, instead of the last unit the learner visited. The Files & Uploads page has just received a much-needed facelift! This new, more intuitive file management page features a drag and drop space for file uploads as well as numerous filtering options, including audio, images, and documents. We’ve also made copying file URLs for each file much easier, so you can add files to course components or external content more quickly. 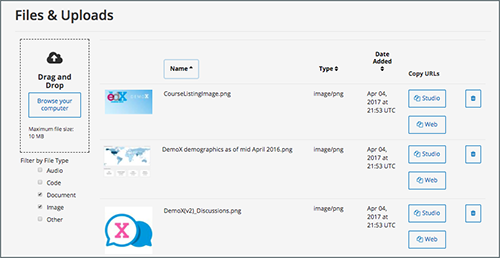 For more information, including an explanation of Studio and web URLs, see the updated Adding Files to a Course topic in Building and Running an Open edX Course. 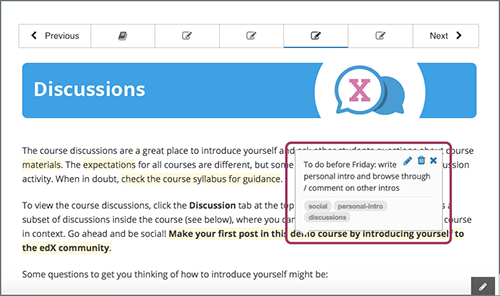 Did you know that you can allow learners to highlight and take notes right on each course page? With the notes tool, learners can add in-context notes and highlights as they move through your course. Additionally, all notes are available on a Notes tab, so that learners can see all of their notes at once and quickly get back to the unit where they made each note. Enabling notes for a course takes less than a minute—you just have to make a change to the Enable Notes setting on the Advanced Settings page. For more information, see Notes Tool in Building and Running an Open edX Course. We’ve added progress indicators to the navigation bar. Next up: the course outline! On the Course page, the course outline will not only include units as well as sections and subsections, but will show the same green check marks that are now visible on the navigation bar for all completed units, subsections, and sections. The next version of mobile is almost here! With version 2.13 of our Android and iOS app, you’ll be able to download all course videos at one time. This new version will also include changes to help you navigate through your courses.